 Do any of the ex pats have stories about their trip emigrating to their new adopted country? We left in 1958, a taxi pulled up to the door of house with the scoutmaster of older brother who was already in Canada. Mr. Bennett was his name and he was escorting to teh station. My Mam and my two brothers got in and looked out the window at the "windolened" house that had been my home for ten years, all my life. We got to the train station that took us Greenock where it poured all the time we were there. the train ride and the time at Greenock is a blur but I do remember getting on a little boat to get totthe big and we were settled by evening. We left about five pm , found our room which I was really excited about , it was economy class two sets of bunk beds in a room the size of a big closet. All I cared about was getting to sleep on one of the top bunks. The family went to see an on board movie but I said I was tired and I went back to get in my pyjamas and climbed into my bunk. I was told off next morning for locking the door as my family couldn't get in and had to call the Stewart. Our holidays in Scotland consisted of day trips to Saltcoats or Portobella. On board ship was like a hotel and I thought I had gone to heaven. The excitement of sailing on the big ocean, quoit games on deck, and table tennis. I soon made friends with another boy who was from Bearsden and was named Ronald too. There was a different picture everyday to see at the cinema. For either a sixpence or a dime you get a treat at the malt shop. A few times there were parties for the kids which included games as well treats. What really intrigued us was the meals , we weren't used to some of the items offered. There wa s choice of fruit juices, of which I tried all the ones I knew I would like but came the day when there wa none left to try except this one called grapefruit. My thinking well I like grapes!!!! Can you imagine the taste to a ten year old's palate for the first time?? The other thing was when the in the middle of the main meal they brought out corn on the cob. I looked at it since I had never seen this bright yellow stuff before and thought , why are they bringing out dessert? The week flew by with lots of good memories but we were anxious to land . I seem to take forever for the ship to sail down the St. Lawrence to Quebec City where it stopped for awhile and went to Montreal. Finally we disembarked. When going through customs my mother found out she had to pay duty on a carton of cigarettes she brought my older siblings already in Canada. She assigned it my older brother of 13 !!! but it was not allowed. The woman beside us was shocked because she had a carton lined for her daughter of nine!!!!! We had just missed the morning train to Toronto so we had to sit in the Montreal train station until 9 pm for the night train. My older brother and I had fun running around and going up and down the escalator. then came a time when I needed to find a public convenenience. We didn't realize about bilingual Quebec,I got to the two doors and it said "Hommes" and "Dames" . I looked at them, wondering which one and then I figured it out. I had seen enough gangster movies that I knew that I didn't go in the "dames". We had lunch at the station restaurant and we were served a salad and I looked the like of it since it looked like it had a cream filling on top, it was my first taste of cottage cheese, another disappointment. Finally we got on the train arrived in Toronto, where my two sisters and brother in law loaded us up to take to our new home. The adventure was almost over and home sickness was looming on the horizon!!! By the way, the ship's name was the Carinthia, anyone sail her? I enjoyed reading your story Ron; it is very interesting. Many aspects of your departure were much like my own... although i left from Southhampton rather than the Clyde. I recall the ship "Carinthia", but I never sailed in her. She was a much more modern ship than the one I sailed in. I still have my ticket for my one-way sail on the "Canberra". Never sailed on her but when she was launched in John Browns in 1952-53 I was there and also on board her before she went on her maiden voyage. I was a nine year old saw her sister ship Saxona, and the Royal Yacht Brittania all lauched around the same time. The Canberra was built in Belfast around 1959-61. Very unconventional funnels or should they be called exhaust pipes. She ferried troops in the Falklands war. The Carinthia changed owners after her Canadian trips came to an end, becoming Fairsea, Fairland, and finally Fair Princess. George, what superb pictures! i remember both these ships very well, especially the Carinthia. Yes, lovely pictures. Annie Laurie, I sailed from Southhampton to Montreal on a ship called the "Canberra", but it wasn't the same ship that you sailed on. It was an old rusting tramp steamer owned by the Greek line and crewed by Germans out of Hamburg. It was not at all like that picture George has posted, not in the least. This was it's last voyage of the 'Canberra' i sailed on; it was scrapped after it. 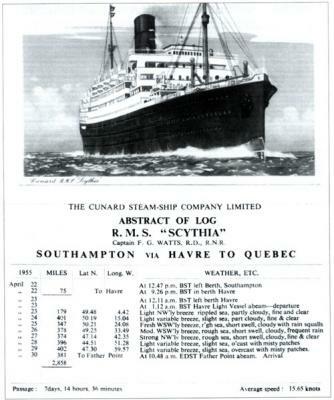 ...and I sailed to Montreal in 1954 in the "Scythia"
I think the trip back was her last voyage . 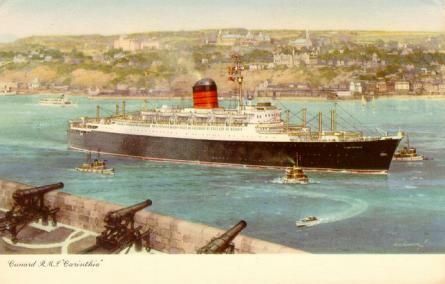 Then I sailed back to Greenock in the Saxonia in 1955....another world....travelling that way. The picture of the Saxonia is almost identical to the Carinthia but I thought you might enjoy this. All these ships sound great. When we came to Canada in 1967 we flew from Renfrew, then just a secondary airport, to Amsterdam and then directly to Vancouver. We came with CPAir as we had been told they were the best with children and as ours were 6, 3 and 18 months then we took their advice. When we arrived in Vancouver a cousin of my mother's took us to live with her in Haney (now Maple Ridge) and I remember looking out of the car window and thinking that everything looked the same as back home. I don't know what I expected, although the day after we arrived in June the took us into Haney and Surrey and everyone seemed to be wearing old fashioned clothes, I did wonder what we had come to. There were decorations all over the place as it was Centennial year and the celebrations were only a month away. We have always said that we thought they were all for us - "the Stewarts have arrived"!! Have never felt really homesick although it gets harder to come back after a visit back home. Love reading all these stories. 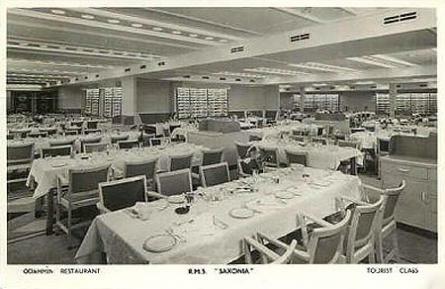 Thanks for pics and yes that dining room does bring back some memories. We hit a couple of rough days during the trip and most of us were feeling a little queasy but headed off to the dining room anyway. The waiters had put up the guards around the table as the silverware was sliding around quite a bit. I ordered roast stuffed Cornish hen (I had never eaten that before) but when it came I took one look at this little brown thing with it's legs sticking up in the air and a paper ruffle at its neck and had to make a quick dash for the ladies room. Mind you I wasn't the only one headed that way.